TV Bulletin Board (Fri., Feb. 24) -- and The Allegheny College Prize for Civility in Public Life goes to . . .
You can never hand out or have enough awards. So PBS duelists Mark Shields and David Brooks will gladly accept this one. They're the first recipients of The Allegheny College Prize for Civility in Public Life. And they plan to talk about it on the Friday, Feb. 24th edition of the PBS Newshour. 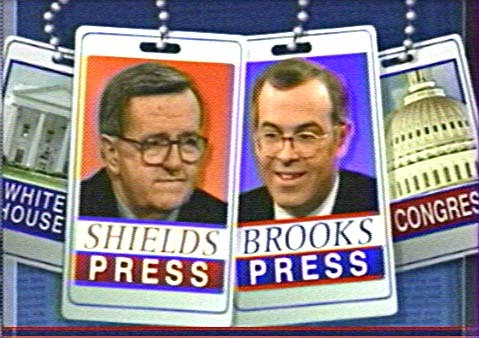 Brooks argues from a conservative position and Shields is the program's designated liberal go-to guy. Neither is a flame-thrower. "Their civil and informative discussion of politics stands in stark contrast to the partisan and often prickly environment that dominates the political landscape today," Newshour executive producer Linda Winslow said in a publicity release. Allegheny College president James Mullen Jr. said Shields and Brooks "demonstrate that civility does not require one to be tepid." And in the view of Newshour executive editor Jim Lehrer, they "deserve this and all other awards there are or ever will be for civility." This'll probably be it. But for good measure, Shields and Brooks are this year's inaugural recipients of the Uncle Barky Good Conduct Medal. ***FX has renewed its ribald animated spy series Archer for a fourth season of 13 episodes. Its ongoing Season 3, which ends on March 22nd, is averaging 3.3 million viewers per episode, with 2.49 million of them in the motherlode 18-to-49 demographic.